Celebrate the 3rd Annual International Sculpture Day in a garden oasis. Bedrock Gardens will celebrate IS Day on Sunday April 23, 12– 4 with works of ten sculptors and a UNH art student show. Visit with the artists, watch an artist create on site, and enjoy other art in a garden setting. The exhibit will be up until May 8th, so visitors to the May 6th and 7th Open House can experience it. For viewing at other times, please make an appointment by e-mailing jill@finegarden.com. Admission donation waived for this event. There also will be a Garden Art Tour held at 1 pm covering an overview of Jill Nooney's garden sculptures, including inspirations, materials used, recurring themes, some quotes from the artist, and a focused look at more than 30 individual pieces throughout the garden. Our first Open House. ​This former dairy farm in rural NH has been transformed over the past 30 years into a stunning landscape with a diverse plant collection, varied landscape design, hardscaping, and an extensive sculpture collection made from re-purposed farm equipment. Enjoy the 3/4 mile walk-around with a guide/map, or wander the several miles of trails. There will be bluegrass music on Sunday, starting at noon, by Lee's own Smith family. Art students aged 10 to 18 from five schools explore insects and flight in a far-ranging installation throughout Bedrock Gardens. The Aviation Museum of NH’s Wilbur Wright, in character, will demonstrate flight kits and give a talk at 2pm on both Saturday and Sunday on how bumble bees manage to fly. On Saturday May 20, 10 to 2 and on Sunday 12:30 to 4, Oyster River Cooperative School District's Jacqueline Bruhn will host a Sustainability Table. Be sure to check out the bug hotel. Learn about "Planting for Pollinators" with 1/2 hour talk on gardening and plants that feed the bees at 11 and 1 on Saturday. ​On Sunday, the Seacoast Beekeepers Association (with Randall Davis and Ellie Coffin) with have an information booth. They will discuss: Why do people keep honeybees in their backyards? What sort of threats are honeybees facing these days? Why, when and who do bees sting? What is the difference between the queen bee, a worker, and a drone? What's in those funny white boxes bees live in, anyway? They will have beekeeping equipment, information about the critical services that bees provide, and how you can learn more about the wonderful and amazing world of beekeeping. There will be a free Tour of the Garden held at 10:30 and at 1:00 on Saturday, led by an experienced and knowledgeable garden guide and plant person. A great way to learn about the garden. The Garden Art Tour on Sat and Sun is cancelled. Bring a friend, your family, and enjoy a unique oasis on the New Hampshire Seacoast. Note: Parking may be limited, but offsite parking and shuttle services will be provided. ​This former dairy farm in rural NH has been transformed over the past 30 years into a stunning landscape with a diverse plant collection, varied landscape design, hardscaping, and an extensive sculpture collection made from re-purposed farm equipment. Enjoy the 3/4 mile walk-around with a guide/map, or wander the several miles of trails. 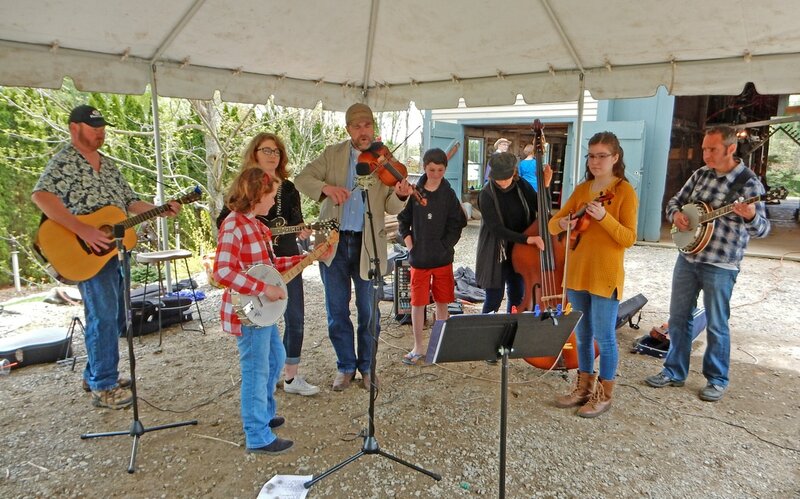 There will be bluegrass music on Sunday, starting at noon, by Lee's own Smith family and the Chicken Shack. Local artisans will display their work on Saturday and Sunday, jewelry, photographs, ceramics, wood pieces and quilts. Artists will be painting throughout the garden. There will be music from 12–2 pm on Saturday by Dale’s Jazz Lab. ​There will be free Tours of the Garden held at 10:30 and at 1:00 on Saturday (only), led by an experienced and knowledgeable garden guide and plant person. A great way to learn about the garden. Bring Dad (for Father’s Day), a friend, your family, and your picnic to enjoy a unique oasis on the New Hampshire Seacoast. Notice: the Antique Auto Show is postponed to the next day, its rain date of Sunday July 2, 2017, 12 to 4. Celebrate the holiday with Members of the Granite Region Antique Automobile Club, who will bring their classic car collection to be viewed on Saturday. Rain date is Sunday. ​Have a picnic with food from the food trucks on site. Ballroom Dancing Exhibition on Sunday. Starts at noon. With a ballroom floor, and instructors, you can dance too! Tom Mitchell from Portsmouth Ballroom will offer impromptu lessons to suit whoever is interested. Dances will includes the waltz, foxtrot, chacha, rumba, and possibly others. Starts at noon. Open House: "Threads: A Fiber Arts Festival"
Watch folks spin, weave, quilt and dye, and view the end products. There will be installations and hands-on​ activities throughout the garden. There also will be a free Garden Art Tour held at 1 pm on both Sat and Sun covering an overview of Jill Nooney's garden sculptures, including inspirations, materials used, recurring themes, some quotes from the artist, and a focused look at more than 30 individual pieces throughout the garden. On Saturday, boxed picnic lunches can be pre-ordered. Details and menu here. Durham Public Library will kick off this festival with exhibit of fiber arts running from June 20th–July 8th, and with a talk by Rosalind Revilock-Frost on June 22. Reception at 6, presentation at 6:30. There will be a talk on "ART:Practical and Metaphysical" by Rosalind Revilock-Frost at Bedrock Gardens on July 15 at 1pm. ​Bring a friend, your family, and enjoy a unique oasis on the New Hampshire Seacoast. On Sunday, August 20th, from 12 to 4 pm, Wildlife Encounters, wildlifeencountersnh.com, will bring a fascinating collection of reptiles, mammals, and birds from around the world. See a NH Chronicles clip on them here. ​Bring a friend, your family and enjoy a lovely oasis on the New Hampshire Seacoast. Note: the Open House is Saturday 10–4, and Sunday 10–4. Wildlife Encounters will be with us on Sunday only from 12–4 pm. SPECIAL EVENT: Tj Wheeler and Charlie Jennison in concert! 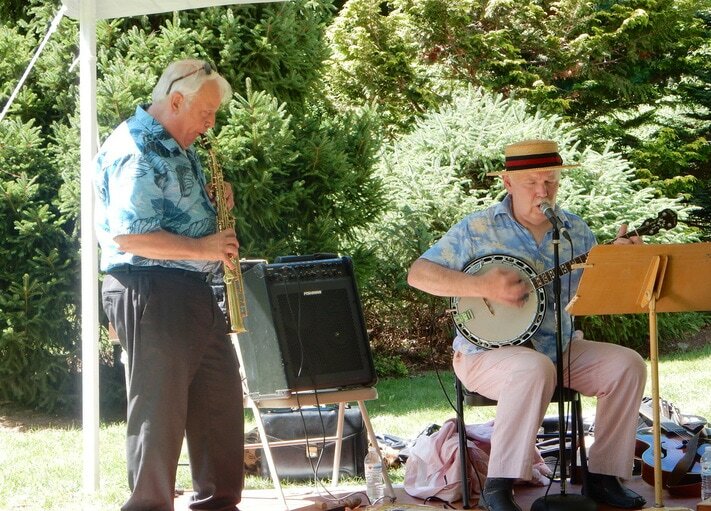 Charlie Jennison on alto sax and Tj Wheeler on banjo at Bedrock Gardens' concert summer 2016. Tj Wheeler and Charlie Jennison will reunite to perform a concert in the garden together. Charlie played a few songs last summer with Tj, but will perform with him for the entire set. You won't want to miss it. Tj Wheeler has been described as a one man Juke Joint. Wheeler considers the honor of being awarded the 2013 NH State Arts Council Individual Artist Fellowship award (for the second time) a crowning achievement in his four decade long career. Check him out here. Charlie Jennison, a nationally known musician, plays multiple instruments and composes jazz music. He teaches sax and piano at the Philips Exeter Academy. Visit his website here. Ayan Imai-Hall, a widely respected tap dancer, will add his percussive tap to the festivities. ​Music starts at 5 pm, Tent is available for inclement weather. Bring your favorite comfy lawn chair or blanket and refreshments. Enjoy Flatbread's pizza served up at $5 per 1/4 pie from its mobile oven. Options include Jay's Heart cheese, pepperoni, and local vegetable flatbread. Tickets can be preordered for $15 by e-mailing hello@bedrockgardens.org. Your support means keeping Bedrock Gardens open to the public! Don't miss this visual & acoustic treat! Langdon Place of Exeter, Griswold Home Care, and the Bedrock Gardens are partnering to have a wonderful charity event. We will have beverages, appetizers, Tai Chi exhibition, Calligraphy demonstration, and wonderful guitar music. Please join us to help raise funds for this year's annual Walk to End Alzheimer's. Bedrock Gardens creates a journey, based on the principle that a garden needs to provide places to go, places to pause and rest, and interesting things to see along the way. Small gardens are connected with broad paths, and filled with interesting structures, unusual plants, and personal landscape design elements. These individual elements become a visual whole, a large work of living art. the combination of unique horticulture, garden design and art makes this garden notable. Come come enjoy the night and help us raise money for a great cause, the WALK TO END ALZHEIMER'S. Tickets for the event will be $25.00 but reservations must be made in advance here. On Saturday and Sunday, boxed picnic lunches can be pre-ordered. Details and menu here. Want to learn about caterpillars, with their extensive diversity, distinctive beauty, and fascinating metamorphosis? The Caterpillar Lab visits Bedrock Gardens, with its awe-inspiring presentations, as seen at the Boston Museum of Science and the Boston Children’s Museum. Here is a review. It is a magical educational show. No additional cost except the donation to the garden on admission. Also, there will be music from 12–2 pm on Saturday by The Jazz Lab. ​There will be a free Tour of the Garden held at 10:30 and at 1:00 on Saturday (only), led by an experienced and knowledgeable garden guide and plant person. A great way to learn about the garden. Note: the Open House is Saturday 10–4, and Sunday 10–4. This event is on Sunday 1–4pm only. We want to acknowledge and thank Eldredge Lumber & Hardware and Atlantic Design Center for underwriting this program. October 1, at 1 pm, a ticketed event. Insect populations have declined 45% globally since 1974. The most alarming part of this statistic is that we don’t seem to care! Yet a world without insects is a world without humans! So how do we build landscapes that support the pollinators, herbivores, detritivores, predators and parasitoids that run the ecosystems we depend on? Tallamy will remind us of the many essential roles insects play, and describe the simple changes we must make in our landscapes and our attitudes to keep insects on the ground, in the air and yes, on our plants. Interesting interview with Dr Tallamy at home here. Details and information on ticketing here. ​Tracy Kane, award-winning Fairy Houses author, www.fairyhouses.com, will read from her books on Saturday and Sunday. Stroll along a Fairy and Hobbit House Trail past houses created by gardeners, artists, and children, and take time to make your own house out of natural materials provided. Find out all the details here. Chili will be available for purchase. See details here. Last year, over 100 children created their own houses. See highlights from last year here. Symmetry Yoga , with Missi D'Arcy, offers classes in its studio in Lee. She will have two classes here, one in the morning on August 7 at 9am, and one in the afternoon on August 23 at 5:30. Part of the proceeds go to Bedrock Gardens, and part go to a nonprofit named for her deceased daughter to support parentless children. Date Changed. Now 9/10. 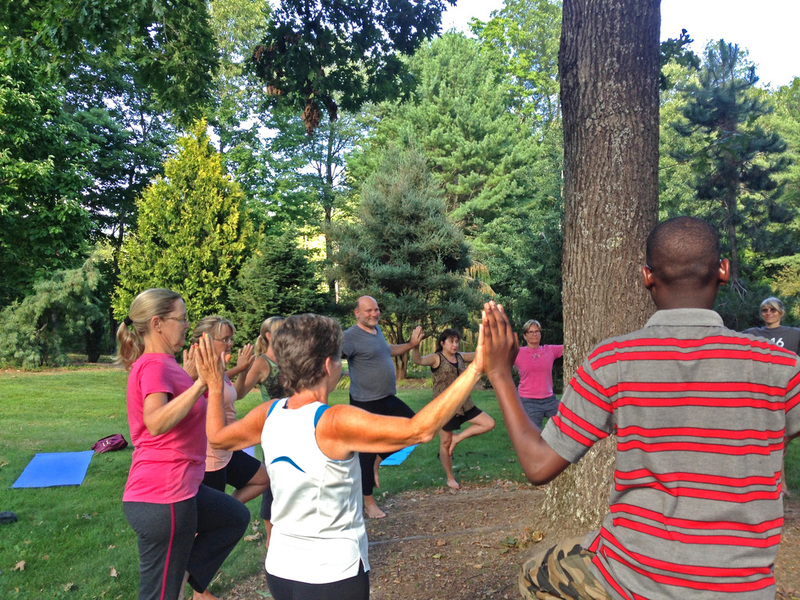 Peace Tree Yoga, with Ruth Barski, offers classes in its studio in Northwood. She will be here September 10 at 10am. Ruth is donating part of the fee to further Bedrock Gardens as a public garden. Thanks, Ruth!